Highlights from my Tornado Chase! It's a wrap! I am officially back in New Jersey and am already missing the everyday excitement I experienced during my storm chase. Over the course of two weeks, we visited 18 states driving over 6700 miles and traveling as far west as Colorado and Montana! Of all the storms we witnessed, 4 stand out in my mind that I would like to share you with, two of which were supercells with one spawning a tornado! On our first real chase day, we drove into the extremely flat and desolate Texas panhandle…prime chasing territory! Here, we observed multicelluar thunderstorms for the first time on the trip. We actually could see one system feed energy into a second cell causing it to blow up into a major storm! The lightning on this day was out of this world and the terrain allowed us to see every detail of the storm structure. To read more about the thunderstorms on this day, see my previous blog titled "Storm Chasing from Kentucky to Texas". 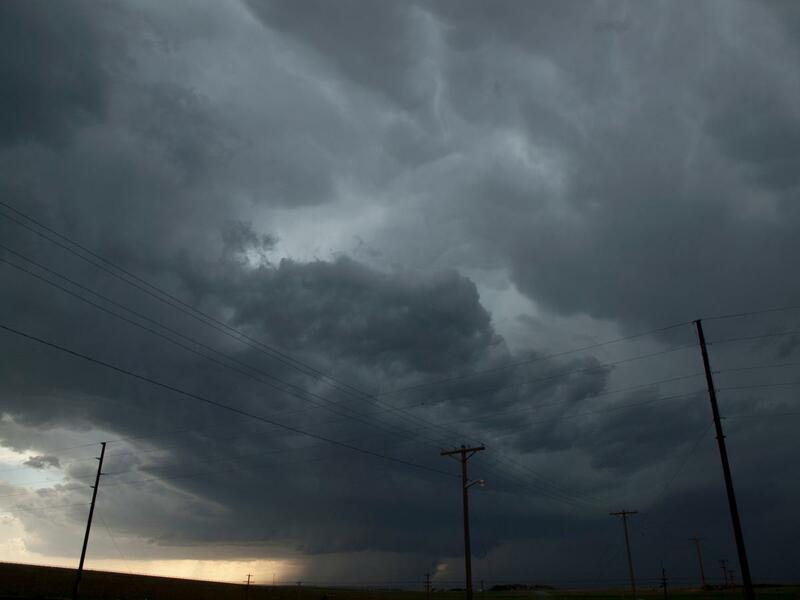 When we were near Cheyenne, WY on June 6 and June 7, we witnessed our first supercells on back to back days! We started in northeastern Colorado knowing southern Wyoming was a likely spot for severe weather and possibly tornadoes on both days. On June 6, we chased the first supercell of the trip which produced the first wall cloud I have ever seen! 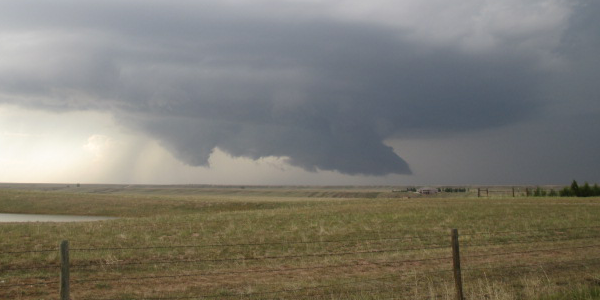 A wall cloud is the cloud base of a supercell that has lowered towards the ground signaling a tornado may drop. Even though we viewed a wall cloud, it did not produce a tornado. But, no one was disappointed because the system was still amazingly complex! We clearly saw air from all directions feeding into the storm and then felt the cool, gusty winds coming out of it. Unbelievable! The next day we again chased in the flat, unpopulated areas near Cheyenne, WY and this time we hit the jackpot and saw a supercell that produced a brief tornado! This was actually one of the more difficult situations because there were a few cells to chase and it really is luck of the draw which one drops out a twister. Luckily, we chose the right cell. Not only did we witness a brief tornado, but we could clearly see the entire storm system rotate. Looking up and watching the clouds turn counterclockwise was incredible and definitely one of the highlights of the trip. Check out my previous blog titled "Finally, a Tornado Spotted!" for more details on this storm and view the time lapse video below to see the storm rotate. Our chase in North Dakota was another exciting day! During the chase, we knew we only had a limited time to catch a cell because the storms were moving north fast...towards Canada. We were restricted to stay in the country so we had to get into a viewing position quickly before the cells hopped the border. While racing north, the radar showed a cell starting to split into two. This was to our benefit because when a cell splits, usually one half continues north while the other makes a right turn to the south…in this case, keeping it out of Canada. However, the cell did not completely split before leaving the U.S. On the bright side, we ended up near the Badlands and watched the storm jump the border from one of the Badland’s spectacular scenic spots. Since the sun did not set until after 10pm, we had time to snap some photos of the other non supercell thunderstorms and witnessed magnificent colors on the towering cumulonimbus clouds during sunset as shown below. During this experience, we traveled through several towns that suffered damage from a powerful tornadoes in the past. One of these cities was Joplin, Missouri which experienced an EF-5 tornado last May. It was amazing to see how rebuilt and back to normal the city was considering the extensive damage it suffered. Visiting Joplin was a nice reminder of why were truly out in the plains searching for tornadoes...not just to observe, but to better understand how tornadic thunderstorms form and use this knowledge to improve future forecasts and warning systems.